If you love caramel apples but are cutting down on sugar, make your own with sugar-free caramels. 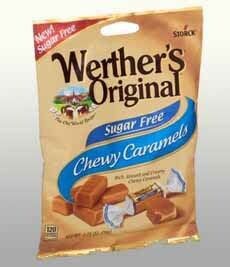 Werther’s makes delicious sugar-free caramels in regular and chocolate-flavored. Pick up a few bags and get dipping! You can use the same recipe with regular caramels. 1. INSERT the wooden sticks into stem end of the apples. Cover a large plate, baking pan or tray with waxed paper. Lightly grease the paper with butter. 2. COMBINE the caramels and water in large saucepan and cook over medium-low heat until the caramels are completely melted, stirring constantly. 3. 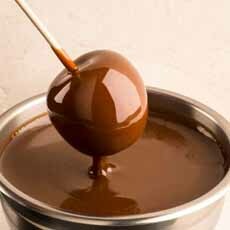 DIP the apples in the melted caramel, spooning additional caramel over the apples if necessary to coat evenly. Place on the buttered paper and allow the excess caramel to drip off. 4. SCRAPE pooled caramel from the bottoms of the apples for neatness. Garnish as desired, then place on a prepared serving plate and refrigerate for 1 hour. Enjoy your apple covered with sugar-free caramel (photo courtesy Daffy Apple). Werther’s makes sugar-free soft chewy caramels and chocolate-flavored chewy caramels (photo courtesy Werther’s Originals). You can also host a candy apple party!